In order to make it easier to make In Slips when transferring merchandise between stores, XpertMart™ can create a Proposed In Slip for every Out Slip that is created. This Proposed In Slip gets synchronized to the Main, and then from the Main to the Remote which is expecting the merchandise transfer. If you choose to use Proposed In Slips, then when you make an In Slip you can enter the Out Slip unmber and XpertMart™ will search through the Proposed In Slips on file to see if one alrady exists for the In Slip you are working one. If it finds one, then it automatically populates the In Slip with all items on the Proposed In Slip (which are the items on the original Out Slip). This way stores do not receive transfers "blind" (though some managers prefer for stores to receive transfers blind since it means they will be more vigilant). Since this configuration setup is under Station Configure, each store or Remote can have the desired configuration. 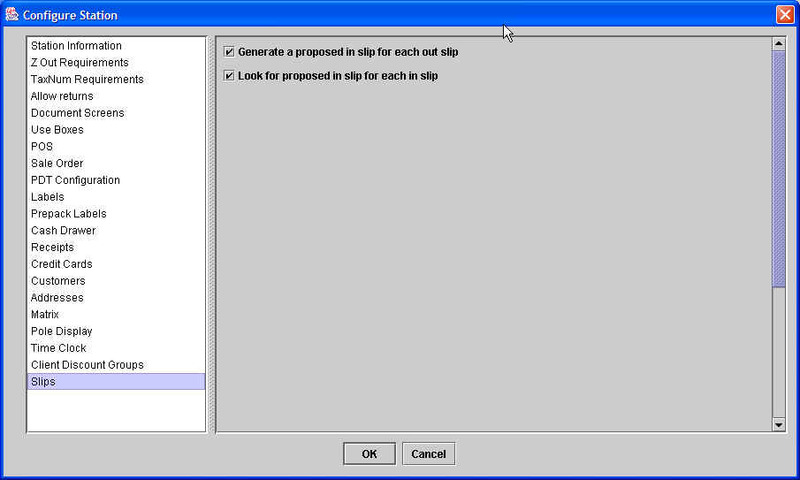 The first configuration option is "Generate a proposed in slip for each out slip". If this option is checked, every time you make an Out Slip a Proposed In Slip will be created with the same items as the Out Slip. During the next synchronization, the Proposed In Slips will be sent to the Main. If you are going to use Proposed In Slips then the first you want to do when making an In Slip is to enter the Out Slip number you are receving against. If the system finds a Proposed In Slip then it will populate the In Slip with all of the original items transfered on the Out Slip. Once these items appear in the In Slip, you can edit these quantities or make any other modification that you can make when working with a normal In Slip. If the system does not find a Proposed In Slip then it does nothing. It does not show any sort of error, it simply does not fill-in any items into the In Slip. In this case you would have to manually enter the items one by one. You may want to only generate Proposed In Slips in your warehouse but not in each of your stores. In this case, these configuration options would only be checked at the warehouse but not at each of the stores. If you want a specific store to manually scan every item it receives in a transfer then you would not check these configuration options at that store. 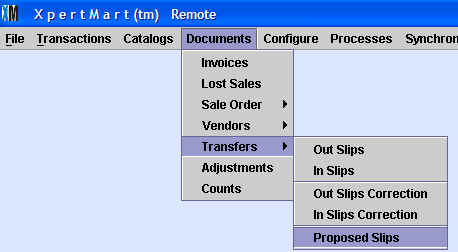 XpertMart™ uses Proposed Slips to communicate desired transfers to the Remotes. Proposed Slips do not ever affect inventory, they are just for reference. The pupose of Proposed Slips is to sugest what merchandise needs to be transferred from one Remote to another. 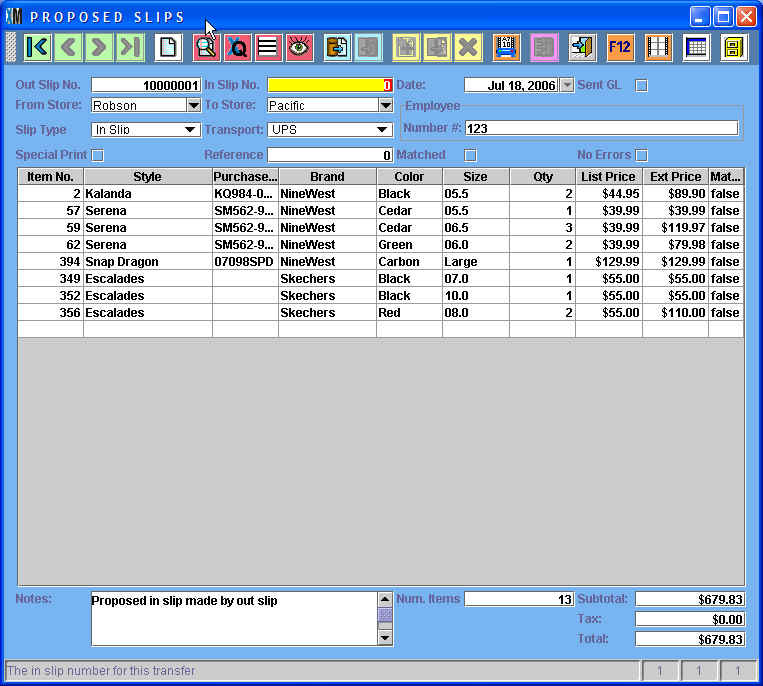 Proposed Slips are used to make In Slips based on Out Slips or to suggest Out Slips to balance inventory. All of the fields look exactly as they do when looking at an In Slip. At the Remotes, when documents are synchronized, any Proposed Slip that has a different store number than that of the Remote gets synchronized out to the Main. At the Main, when catalogs are synchronize, all proposed slips are sent out to the corresponding remote. A synchronization file is created for each store. Following this scheme, every Proposed Slip gets synchronized to the appropriate store. If you only synchronize once at night then the Proposed Slips would make it to the intended store the following morning. Recall that you can always use the Task Manager to schedule the synchroniation to ocurr several times per day if so desired.